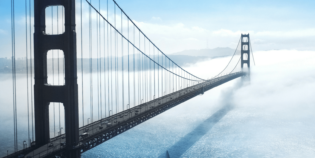 Search engine traffic is more of a winner-take-all endeavor than most of us realize. Just look at clickthrough rates for search engine results: The page that sits in the first position for a search query gets 32.5% of all the clicks for that search. The site just behind it – in the very respectable second position in the results – gets about half that much traffic, with just 17.6% of clicks. By third position, you’re down to 11.4%. Anything below 4th position and you’re below 10%. Ouch. While that’s an interesting statistic, what does it really mean for your site? Well, here’s part of what it means: If the keyword you want to rank for gets 1,000 searches a month, here’s how many clicks you’ll get from that keyword depending on where your page shows up in the rankings. The page in first position will get five times as many clicks as the one in 5th position. That means going after keywords with less competition can make up for a keyword having less overall search queries. That’s because you’re more likely to get more clicks from less competitive terms. Let’s say keyword 1 gets 5,000 searches per month. It’s quite competitive, but you can still rank in position 5 for it. Keyword 2, a similar keyword, gets only 3,000 searches per month. But it’s less competitive, so you can rank in 1st position for it. Despite going after the keyword with less overall searches, you’d actually end up getting more than THREE TIMES the clicks because you went after the keyword with less competition. In the table above where I showed you how to get three times as many clicks by going after a less competitive keyword, the competitive keyword with 5,000 searches per month would be a “head keyword”. The less competitive keyword would be the “long tail keyword”. Long tail keywords are also sometimes called “long tail terms”. As you can see from that table, long tail keywords are almost as good as gold. You bet. 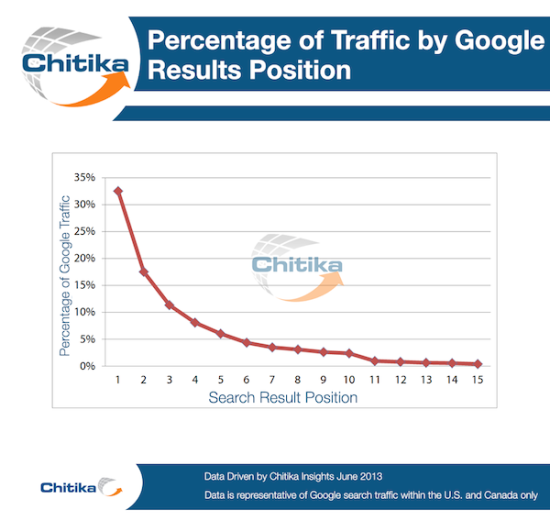 Long tail keywords actually make up 70% of all searches. Here is a mind-bending factoid to expand on this: “Every single day, 15% of the questions people ask of Google are questions we’ve never seen before. Every single day – for the entire existence of Google – roughly 15%. So every day, people in the world are asking questions that have never been asked before”. That’s according to Jon Wiley (http://www.bloomberg.com/video/behind-google-s-obsession-with-perfecting-search-c6KcoGikT0m2KFqHuzYGoA.html), the Lead Designer of Google Search – certainly a guy who should know. Not only are there a lot of long tail keywords, but they also tend to convert 2.5 times better than head keywords. And they’re drastically less competitive than head keywords. Now that you know how valuable long tail keywords can be, how can you find them? HitTail is a paid service that recommends long tail keywords for you based on your existing search traffic. It has gotten some impressive results for a quite few sites, but you’ll need at least 1,500 unique visitors per month for it to work properly. If you have that much traffic, it’s at least worth a try. If you don’t have 1,500 uniques per month yet, keep working this long tail keyword angle and you will soon. 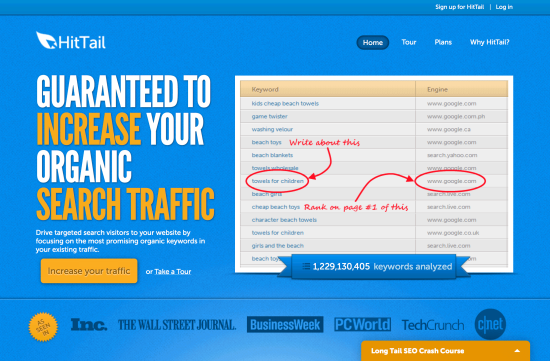 Caption: Hittail is a popular tool for finding long tail keywords tailor-made for your site. Also known as the Google search box. This is almost too obvious, but Google gives you long tail keyword suggestions every time you type something into the search query box. If you don’t have your Google Webmaster Tools account set up yet, it’s way past time to get that done. If you do have your Webmaster account set up, you’ve already got some nice long tail keyword recommendations. Just go to Search Traffic > Search Queries and you’ll see which keyword searches are driving the most traffic for your site. You’ll even see what the average position in the SERPS is for your pages, and what your click-through rate is. While most of the keywords in your Google Analytics account will show up with the dreaded “keyword not provided”, you will still see some long tail keyword information. Just go to Acquisition > Keywords > Organic in your Google Analytics account. You may get some ideas, but not that too many. My Analytics account showed “keyword not provided” for 97% of the searches my site gets, but at least I got a few ideas for long tail keywords. 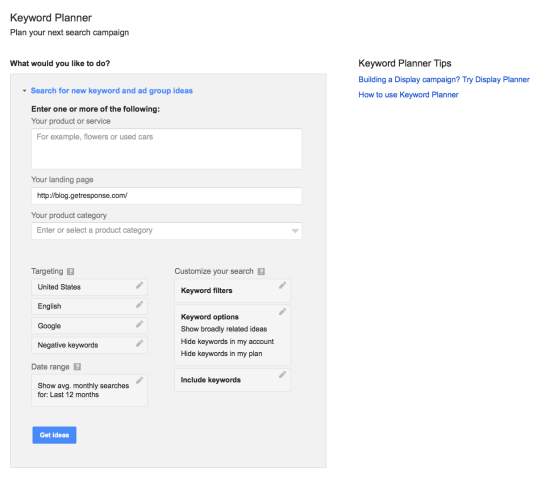 You can, of course, use the Google keyword planner (aka the Google keyword tool) or any other keyword tool you like to find long tail keywords. My favorite tool for long tail keyword research is Moz Pro, because it includes a super-handy keyword competitiveness metric right next to searches per month. The only drawback? Moz Pro is $99 a month, though there is a 30-day free trial. This is a variation on using the Google Keyword Planner, but there’s a nice feature in the planner that can help you spy on the keywords of your competitors. Instead of putting a keyword into the planner, paste in the url of a page you want to see some long tail keywords for. Google will then show you up to 1000 related keywords for that page. 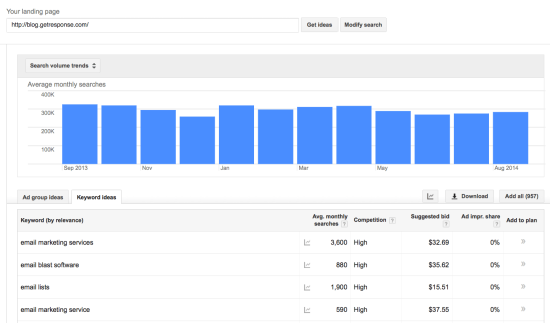 You can even see estimated search traffic by month, and you can break down searches by device or location. This is another paid service, but it does have a 10-day free trial. I have more experience with HitTail than Long Tail Pro, but it’s a tool many people recommend. I get it a test drive a few years ago and found it helpful. So now you know how valuable long tail keywords are, and you’ve probably found a few of them that directly apply to your business. Now what do you do with them? The first thing you can do is to think of a blog post you could write around each of the long tail keywords you have. Then you could use the free WordPress plugin, WordPress SEO by Yoast to optimize your post for that keyword. While you’re at it, use that plugin to optimize all your pages. Just remember that the age of keyword stuffing, keyword density and writing for search engines is over – really over. So don’t overuse your keyword, and make a habit of including lots of variations on that keyword. In other words, write like you would write for people. Don’t use the same word over and over again – vary it, or your writing will sound stilted. 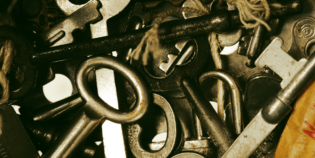 Varying keywords and not over-optimizing your pages makes them more pleasing to read for human visitors. It also gives sophisticated search engines important cues that you’re not trying to game the system. Learn how organic search and email marketing can work in pair to increase your online marketing performance.